Donald Eric Phillips was born June 30, 1922 in Braeside, Ontario. After attending Arnprior District High School in Arnprior, Ontario, Phillips went to work for Gillies Lumber Mill in Braeside, Ontario in 1938. On August 14, 1940, Phillips joined the Lanark & Renfrew Scottish Regiment as a Private (C 416548). On July 9, 1941, he received his discharge papers and joined the Royal Canadian Air Force (RCAF) as a Leading Aircraftman-Mechanic (LAC, CAN R111651) July 17, 1941. During this time, he received the Canadian Volunteer Service Medal and the Maple Leaf Medal for severing overseas. Phillips was honourably released from duty on October 3, 1945. After the war, Phillips worked for Ontario Hydro at Stewartville Dam. In 1947, he relocated to Sudbury, Ontario for a position at the International Nickel Company (Inco). 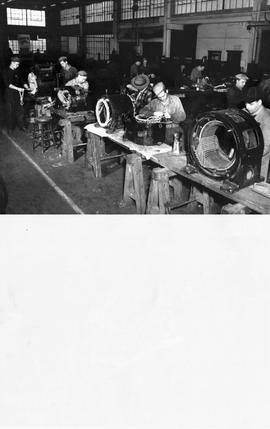 Phillips was employed in the Electric Motor Shop and Winding Room section of Inco for approximately ten years. Phillips retired from his company in 1990. He was an active member of the Royal Canadian Legion and he also was a ham radio operator with the call sign VE3S01. Donald Phillips passed away May 18, 2000 at the age of 77. Records were donated by Douglas Phillips in 2014. Charlotte Phillips (nee Vance) passed away September 26, 1979.